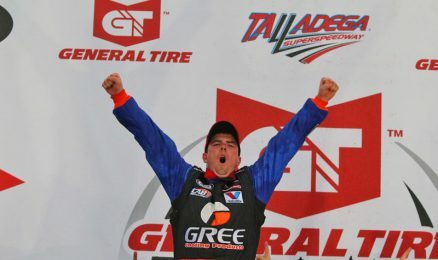 A matter of inches made the difference in Friday’s General Tire 200 at Talladega. Gus Dean and Josh Williams ran side-by-side until a multi-car crash behind them erupted. ARCA officials ended the race under yellow with lightning in the area and at the time the caution flew, the videotape showed Dean’s No. 98 Chevrolet was barely ahead of Williams to score his first career series victory in his second start. “Obviously, it was a top notch car,” Dean said. It got really hairy there towards the end. Mason and those guys made a heck of a pit strategy, still getting used to this deal. They made a really excellent pit call, it really played out for us. We were able to come back from the field and the guys did an awesome job on pit road, got us in, got us out. It just all played out for us and we drafted right and had an awesome spotter on top, Tyler Green. Couldn’t have done it without GREE cooling products and and Cab Installers. Dean ran the No. 98 Chevrolet in the season-opener at Daytona and got collected in a lap 2 crash including his Mason Mitchell Motorsports teammate Cole Powell in the wreck. The 21-year-old driver was quick during Daytona testing and MMM gave him another chance to drive the entry at Talladega. Nashville winner Josh Williams also had a good car Friday as teams still run steel bodies on the restrictor-plate tracks. Williams was up front most of the evening until being barley edged by Dean once chaos ensued behind them. The calm before the storm ended with two laps to go after Dustin Knowles got hooked in the right-rear by Mark Thompson while he made hard contact with 2001 Talladega winner Bobby Gerhart, who was also OK after the crash. Knowles walked out of his No. 14 Jent Motorsports car after a nasty head-on collision with the backstretch wall. Friday’s General Tire 200 ran caution-free for the first 44 laps until Korbin Forrister and Andy Seuss got together coming onto pit road and Seuss’s Our Motorsports machine didn’t get going for the race’s first caution. Forrister was also involved in the race’s final caution and took a hard hit to the inside wall. All four drivers in the late crash were evaluated and released from the infield-care center. Will Kimmel (third) and Chase Briscoe (fourth) teamed up to go from the back, to the front, to the back, then to the front again, but neither grabbed the win in both sponsor-less cars. Empire Racing’s Sean Corr finished fifth in the No. 48 Ford to round out the top-five. Pole-sitter Tom Hessert was sixth, followed by Venturini Motorsports teammate Dalton Sargeant in seventh, making his superspeedway debut at Talladega. Defending General Tire Superspeedway Challenge champ Matt Kurzejewski took home eighth to make it back-to-back top-10 finishes in the last two races as Bret Holmes and Brady Boswell completed the top-10. Daytona winner John Wes Townley cut a tire early and caused enough damage to his No. 05 car to spoil any chances of becoming the first driver in 16 years to sweep both restrictor-plate races in a season. The next stop for the ARCA Racing Series presented by Menards is in their backyard at Toledo Speedway on May 22 (American Sports Network). Todd Gilliland is the defending winner of the race.